Kinsale is a small picturesque harbour town located on the southern coast of Ireland. This quaint town has many popular attractions, ranging from experiencing the local heritage, to sailing and deep sea angling to golf. Kinsale is also located close to The Blarney Castle which has been a popular Irish tourist location for many years. Check out the Kinsale website. Pictorial maps of Kinsale are available here and here, which can be used to locate the conference (shown as H on the map), a number of accomodation locations (A,K and H on the map) and numerous places to eat. This year the workshop will be held in the (The Trident Hotel) (H on the map) Kinsale, where a block of rooms have been set aside at a reduced rate. Accomodation is also available at The Actons Hotel (A on the map), The Blue Haven Hotel (K on the map) and Perryville House (right-hand end of Perarse Street on the map). Special reduced rates have been arranged at the Trident Hotel (location of conference) which will be available until May 17 2004. "Executive Rooms" are available for E150 (single occupancy) or E90 (double occupancy). Note that the Trident Hotel also has lower-quality "Standard Rooms" but since these are soon to undergo renovation we did not negotiate a special rate for these or include them in our agreement with the hotel. All reservations must be made direclty with the the hotel. Please use the group name ACM/NOSSDAV when making reservations. As well as Hotels, there are many B&Bs located in Kinsale such as The Pier House, The Tesben House, The Holidayhound and Ocean View Guest Suite to name but a few. 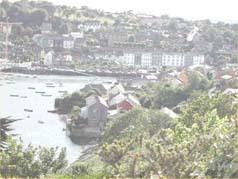 As Kinsale is a very busy tourist destination, we would advise that you arrange your accommodation as soon as possible. Kinsale is on the south coast of Ireland, about 20 miles by road to the south of Cork city, the capital of County Cork and the second city in the Republic of Ireland. It is possible to reach Cork by air or sea. Direct flights from the US to both Dublin and Shannon Airports are provded by Aerlingus. Bus Eireann provides a direct bus service from both Shannon and Dublin Airports to Cork City the following is a summary of the services they provide (schedule). From Cork City a Bus or Taxi can be used to reach Kinsale. Iarnrod Eireann provide a train service from Dublin and Limerick to Cork City. Both Airports provide direct Bus services to the train stations. Approximate journey times for trains are 3 hours and 2 hours for Dublin and Limerick respectively. More information on these services can be found at: Bus and Train information, Dublin Airport and Shannon Airport. Cork International Airport has direct flights from Alicante, Amsterdam, Barcelona, Belfast, Birmingham, Bristol, Brussels, Cardiff, Dublin, East Midlands, Edinburgh, Frankfurt, Glasgow, Jersey, Leeds, London (City, Heathrow, Stanstead amd Gatwick), Malaga, Malta, Manchester, Milan, Nantes, Nice, Paris, Prague, Plymouth, Southampton, Swansea and Rome. Scheduled buses, run by Bus Eireann, travel between Kinsale and the airport, which is about 15 minutes drive from the town. On Monday through Saturday, the Kinsale bus leaves the airport at the following times: 09:00, 10:00, 12:00, 13:30, 15:00, 15:45, 17:00, 18:15, 19:15. On Sunday, the Kinsale bus leaves the airport at 09:45, 12:45, 14:45, 18:15. The one-way fare in 3 euro. It is also possible to take a taxi from the airport to Kinsale -- from the rank at the door of the passenger terminal. The fare is usually in the range of 32 to 35 euro. Cork Ferryport provides connections to Swansea in Britain and to Roscoff in France. For those bringing their own car by ferry, Cork Ferryport is about 30 minutes drive from Kinsale. For those coming as foot passengers on a ferry to Cork Ferryport, the cheapest way to reach Kinsale is to take a public bus, to Cork Bus Station in the city centre and then transfer onto a bus to Kinsale. If you are thinking of bringing your car, you will probably be interested in touring, so you may not be concerned to arrive at the ferry port closest to the conference site. Some other ferry routes to Ireland include those operated by Irish Ferries between Rosslare in Ireland and Roscoff and Cherbourg in France and between Rosslare and Dublin in Ireland and Holyhead and Pembroke in Wales. Stena Line offer several other ferry routes between Ireland (north and south) and Scotland and Wales. For those who prefer to travel by surface transport but do not wish to bring their own car, it is possible to come by train or long-distance coach. For long-distance coach travel to Cork from a wide range of UK and European destinations -- see Bus Eireann/Eurolines. See Irish Rail for information about train travel within Ireland, including information about rambler tickets which allow unlimited travel over the whole island, north and south.